FROM THE FORMER IRA MEMBER AND AUTHOR OF THE INFORMER, SEAN O'CALLAGHAN 'Very interesting on how fanaticism can develop within a community, and especially relevant today.' Bob Geldof The story of revolutionary James Connolly, his role in the 1916 Easter Rising, and his subsequent influence both on O'Callaghan himself, and on 20th century Irish politics. The story of revolutionary James Connolly, his role in the 1916 Easter Rising, and his subsequent influence both on O'Callaghan himself, and on 20th century Irish politics. Easter Monday, 24th April, 1916: James Connolly, a 48-year-old Edinburgh-born Marxist and former British soldier, stands at the top of the steps of Liberty Hall, Dublin. 'We are going out to be slaughtered,' Connolly told his comrades, and with this he set in train the Easter Rising of 1916. Two weeks later, in a scene that has haunted Nationalist Ireland ever since, he was carried to his place of execution having been badly wounded. Placed on a chair, he was shot dead by soldiers of the army he had once served in. This is not a traditional biography; it is a book about Sean O'Callaghan's relationship with a man who was to deeply influence his formative years; it is about the politics of violent extremism that O'Callaghan subsequently became caught up in; and it's about the kind of individuals who are willing to sacrifice everything, including their lives, for a holy cause. Never has a book been more timely. 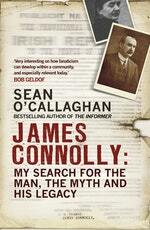 Love James Connolly? Subscribe to Read More to find out about similar books.